In fact I have never seen a ‘Tiger Sanke’ with my own eyes in my entire life. In those tiny indoor ponds I saw Kohaku, Sanke, Showa, Kujaku, Kumonryu and a few other Kawari varieties. Yes, there were Sanke to view but none with sumi that even nearly resembled the stripes of a tiger. On the other hand there certainly was a ‘Torazo’ there and his name was Hiroshi Kawakami – he of the kind face. It was in spring 1982 I paid my next visit to Torazo, one of the few breeders with indoor houses and thus one of the few Yamakoshi breeders with Koi in a suitable condition for sale. I found it very easy to communicate with Hiroshi although in all the years I returned to him, apart from varieties, breeders names and village names, I don’t think we actually ever said more than two words to each other – ‘Hello’ and ‘Goodbye’. Bear in mind I still didn’t really know anything of the other breeders in the surrounding areas in those days and whilst I did buy a good quantity of Go-Sanke from him on that visit, there were also other varieties needed. ‘Ai-Goromo?’ said I pointing all around me. Hiroshi looked at me and pointed towards the mountains to his right; he then deliberated for a second or so and then beckoned me towards his car. He drove only a mile or so before turning left and soon stopped at the roadside and pointed to a house with a large shed that was accessed by a track over a small rice field. He led me towards the shed, slid open the door and then pointed to the pond after saying ‘Ai-Goromo’. These were not just ‘Ai-Goromo’ – these were the real things and some were huge approaching 50cms. Whilst I stood there taking them all in, Hiroshi disappeared only to come back in minutes with the breeder who had produced them. 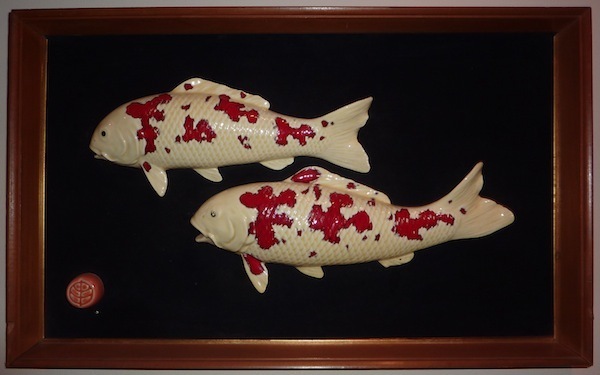 I do remember buying four of these beautiful Koi and also remember that Ian Stewardson purchased the very best one some months later on his very first visit to my shop! From spring ’82 to autumn ’83, it was Hiroshi who taught me much of the geography of the area and made assorted hand-drawn maps for me to study and then insert the breeder’s names in English after he’d first spoken them to me in Japanese. Hiroshi introduced me to Izumiya when Seniichi’s father was running the operation. Back in the traditional times of buying Koi when the person who introduced the buyer was more valued than the buyer himself. On the next trip I returned alone but the father refused to sell me Koi unless Hiroshi was with me! All of those early business traditions have flown out of the window long ago! Atsushi Suda traded on the outskirts of Ojiya long before he moved to Kowada. He was enormous in those days and produced just about every variety possible including some of the rarest ones in Niigata. In the ‘80’s I bought many Koi from Suda after being first taken there by Hiroshi. On that very same spring ’82 visit, Hiroshi took me to the private house on a street in a quiet part of Ojiya and introduced me to Mitsuo Hasegawa. I can’t even begin to consider how many Hasegawa Koi I have purchased since that initial visit. Then there were the drives to Kitayama and Wakatochi where he introduced me to Hosokai and Hirashin; both turned out to be major suppliers for me. I can still recall the autumn ’82 visit when he first opened up Koide Town to me and almost destroyed my eyes after first witnessing the jumbo Go-Sanke on open display at the Yamaguchi outlet. The trips made by his narrow truck were the most enlightening. If we started off in the truck as opposed to his car I knew we were heading to somewhere not so easily accessible. Bumping up and down mountain tracks or skirting around paddy fields made no difference at all to this man; at times it felt like he knew the whereabouts of every single Koi in Yamakoshi – and he probably did. Irrespective of the breeders he introduced me to, one thing came over loud and clear to me – this was reinforced with each new introduction – and that was the enormous respect that this quiet, happy-go-lucky man commanded from his peers. He may have been unknown to the western world in those times but to all the Koi folks of Japan, the name of ‘Torazo’ was legend. Whilst writing this, other items raise thoughts and recollections in my memory of Hiroshi. Of the many visits he gave his time and energy to the young Waddy, one such thing was that he never once introduced me to any breeder that did not turn out to be anything other than honest and genuine throughout the years. There were rare occasions I’d had a beef with a few of the outlets that had given me a bad experience. When I mentioned the name of the outlet, Hiroshi’s eyes would widen, he’d repeat the name to check he’d heard correctly, I would nod and he would shake his head and then end it all with a smile. He was well aware of the few to avoid. Hiroshi and his wife had two sons; the elder one lived in Tokyo and was involved in the early years of computer production. I first met Tsuyoshi, the younger son around late ’83 whilst he was on mid-term leave from his university education. He probably was the quietest young guy I had ever come across and spent most of the time upstairs in his room listening to or playing music of the day, it sounded to me he had a guitar. I think the first conversation we had was about music, (he always has a command of some English – even then) he certainly didn’t show any interest in becoming involved with Nishikigoi in those early days though. In fact it wasn’t until the early ‘90’s that I first saw him mixing with guys such as Seiji Hiroi & the brothers Maruhoshi that gave an indication he intended to continue the family business in later years. 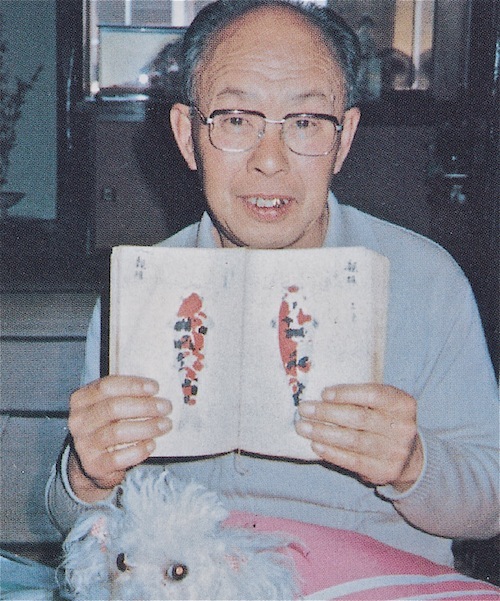 In 1985 I interviewed Hiroshi and took the shot here showing him displaying pages from the 1920’s pattern book that his father kept as a record of his Koi production in the days before colour photography was available. The interview finally came out 10-years later in ‘Koi Kichi’ as did some historical details of ‘The Torazo Sanke’. After the interview, Hiroshi took this porcelain display from a drawer of a wooden cabinet and explained to me, via the interpreter, the real details as to how the bloodline came about. This is a faithful representation in body shape, pattern and SIZE of the original parent Koi used. The female was the larger of the two and in 1950 measured just 34cms at seven years old! The male parent is at the top and the female below and if one looks very closely the tiny specks of sumi present could be honestly mistaken for shimi. However, it was the fry born from these original parents that replicated the parents almost identically but, as they grew, some areas of sumi increased dramatically into ‘tiger-like’ stripes. Hence the name ‘Torazo’ and it stuck! I have yet to hear of anyone referring to the outlet with the official name of ‘Urakawa Yorijo’. A local artist from Ojiya who placed his red name stamp at the bottom left, was privately commissioned by Hiroshi’s father to produce this unique porcelain work of art. I am told that only this one was ever made. After the perfect cast had been completed to satisfaction and the porcelain casts were checked to be correct, the artist smashed the clay former in view of Hiroshi’s father to confirm that it could never be used again. After the interview ended, the interpreter advised me that Hiroshi wished to present the work to ME as a GIFT! I did protest of course – several times, but Hiroshi simply refused to take ‘No’ for an answer. I carried the well-packaged piece back with me on the plane as cabin baggage and clutched it tightly to my chest all the way home! FOOTNOTE – the more I write about these experiences and now consider how I viewed them at the time, it does become a little surreal on serious reflection. In those days I supplied many of the Koi outlets in the UK and yet few of the owners if any would ever consider visiting Japan to find Koi. Whilst for me it was pure excitement together with much mystery. I had Japan to myself until around ’86 when some other overseas Koi dealers first started to appear. Hell? No I was in heaven – a fan surrounded by his idols! I was doing the only job in the world that I wished to do and was getting paid well to do it – every single day brought a new experience and some new memories for later. I honestly thought there was no one else barmy enough to get a similar kick by doing what I was doing? Yes, there must have been many thoughts going through my mind at the time but these were merely day-to-day things together with jotting down new experiences etc. What I’m trying to say is that I never once considered back then that some 28 years later there would be some people who’d find my early exploits worth a read – it certainly wasn’t planned at the time!